On October 17th, 2018, cannabis was legalized in Canada, but how it is distributed varies across the country. 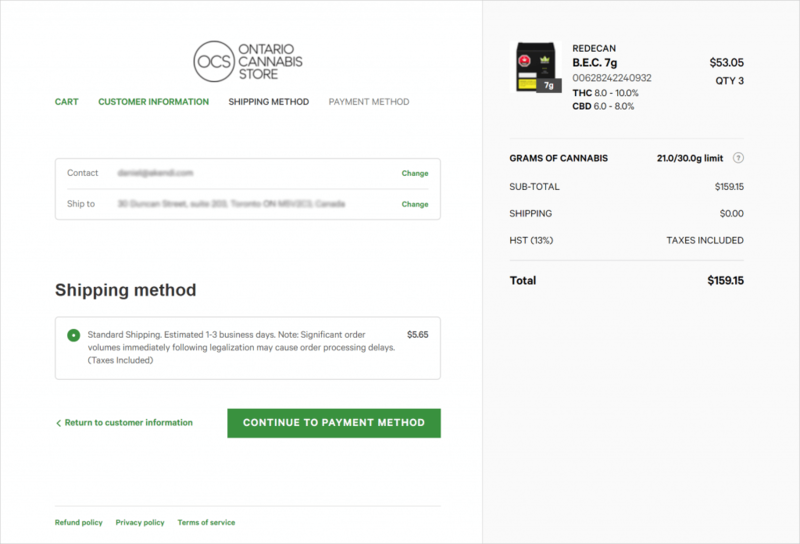 In Ontario the only legal way to purchase cannabis is online through the Ontario Cannabis Store website (www.ocs.ca). Since the excitement and expectations were high, I decided to visit the site. On the first page, users are presented with a prompt to enter their date of birth (figure 1). I chuckled a little at the idea of asking users to self-identify because it provides no assurances that minors will answer truthfully which begs the question of whether it is necessary at all. What made this step even more amusing is the clear note that specifies that the information I’m about to give will not be stored beyond my current session. I assume the Ontario Government must ensure they only sell cannabis to citizens 19 years of age and older but so far their site’s user experience makes it really unclear how and why this information will be used, if at all. In addition, users are forced to manually click to select dates in each of the three fields. There is no option to type in the date of birth. These type of split-date fields work well on the mobile version of the site, thanks to scrollable date pickers such as those found in many iOS apps, but on desktop versions, split fields feel like a lot of unnecessary steps. Once all date fields are completed, the user is still required to click the Verify button which, again, just seems like an unnecessary step. 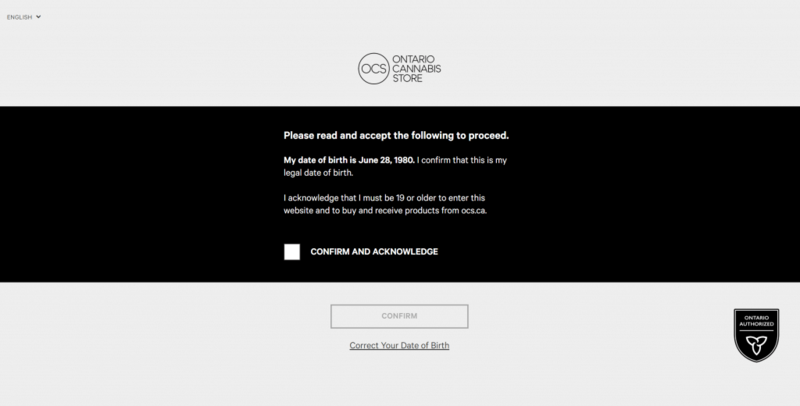 On the second screen (figure 2), I am presented with the birth date that I provided on the first screen and am asked to “Confirm and Acknowledge”. From the user’s point of view, there is very little value in this confirmation, despite having the option to go back and correct the date of birth. It, once again, feels like a redundant extra step. The third screen is a splash screen, reminiscent of a very retro-style, late 90’s website design, but I’m not sure if that was intentional. The options here are to “start browsing” or to “learn more about cannabis”. I found ‘browsing’ to be a bit vague and would prefer to see a more descriptive label such as ‘shopping’. Interestingly, on my second visit to the website the following day, my two options become “take the tour” and “start shopping”. It’s not clear why I would want to ‘browse’ on my first visit but ‘shop’ on my second but I am assuming this is an error in their design’s consistency. Once you pick a path (browse, or learn), you can’t return back to this point, which is fine, because so far these three pages have not been helpful to me, as a user. Finally, I land on the homepage (figure 4). 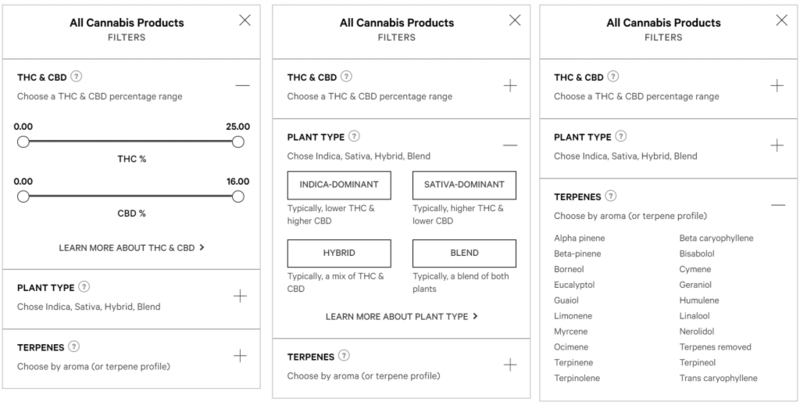 The top navigation is narrow, so it is clear where I need to go if I wanted to make a purchase for cannabis or equipment, or to learn more. “Take the Tour” is a bit misleading since it just takes you to a page with a list of the rules around the purchasing and use of cannabis. As a novice user, I was expecting a more guided introduction to the various products and get help in identifying what I should be purchasing in terms of equipment. Since there were no clear guides, I decided to proceed to the product lists. I also visited the site later from a mobile device, and the while the site is responsive, the text and buttons overlapped the images, making them difficult to read. Having seen my fair share of Seth Rogan and Cheech and Chong movies, I recognize the references/product names (figure 5), but to be honest I’m lost as to what to do next. Other than price (which does not clearly indicate that it’s per gram pricing), I’m not really sure how to decide which product to pick. I decide to try out the filters to see if I can reduce the number of options presented. There were three filters available (figure 6), and again as a novice I’m stumped by the language. Also, the language does not make the product appealing. While a tooltip provides a useful description of what a Terpene is, everything in the list below sounds like something I would find in a home cleaning product. While playing with the THC and CBD sliders to find the right balance I often ended up with no results that met my requirements. Having selected a product that interested me, I wanted to learn more (figure 7). There were quite a few pictures, which turned out to be the same set of pictures in the French and English packaging. 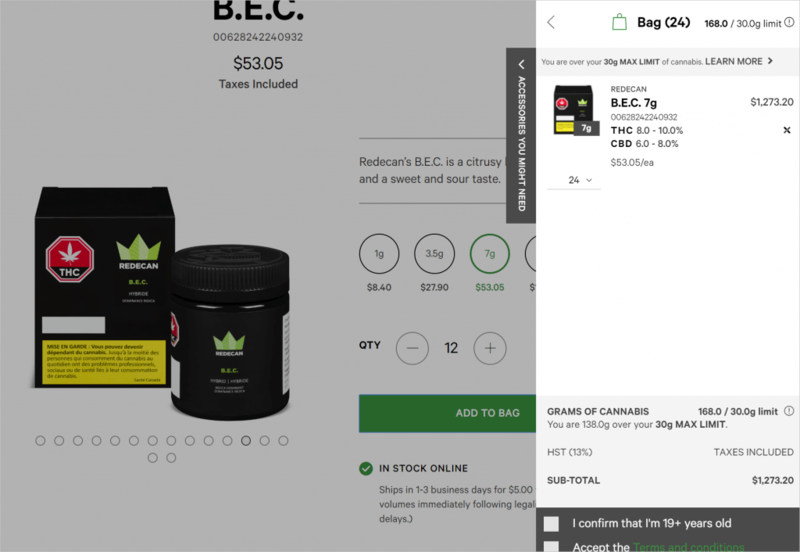 Now, the rules state that you can only purchase 30 grams of cannabis so I was surprised I was able to add 24 packages of the 7 gram size, for a total of 168 grams, to my shopping cart (figure 8). Sure, users are not able to check out until they remove the extra items, but why allow users to add that much of a single product in the first place? Added bonus, I have to confirm my age for the third time! Surprisingly, the rest of the checkout flow was straightforward. I felt the usefulness of the second step—selection of shipping method (figure 9)—was questionable because there is only a single option, but I presume this is for future improvements. 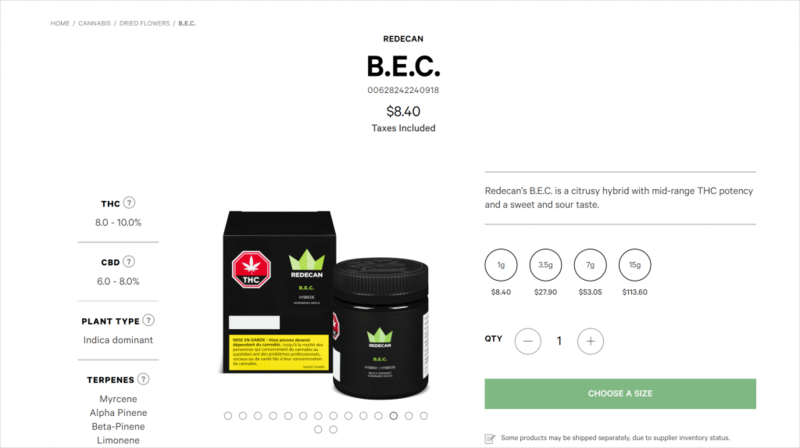 In this day and age, if an eCommerce store launched in the current state of the ocs.ca, it would be doomed to failure. The manner in which products are presented and the language of the site only appeals to an experienced audience, and the site makes no attempt to support the novice user. 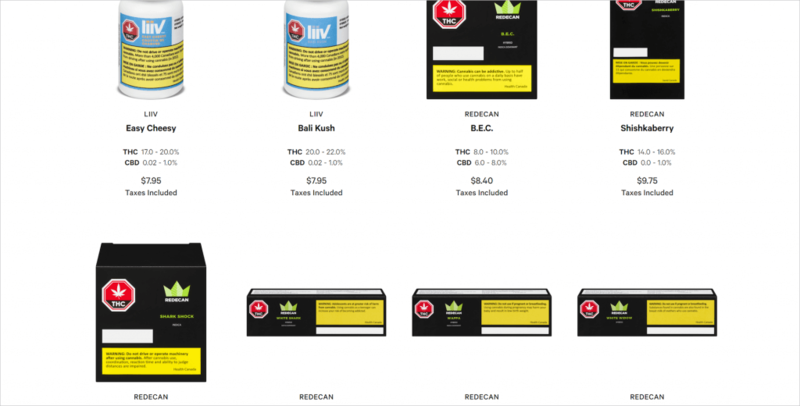 Fortunately for ocs.ca they have a monopoly on the retailing of cannabis. In a competitive market, this site would not be sufficient. Next articleNeed Help Wireframing Your Nonprofit Project? Let Us Help!